The Life & Loves of Lolly : Does my son have autism? Does my son have autism? For a while now, we've known that Joey has a few development and behavioural issues. We've been quite lucky that the ball started rolling fairly quickly and Joey is now being assessed to see if he's on the autistic spectrum. On a daily basis we struggle with Joey and over the past month, things have become increasingly difficult. His tantrums never seem to end and the smallest thing turns into a meltdown. About 2 months ago, Joey and my husband attended a session with other kids like Joey to discuss the issues that he has. After nearly a month, we finally recieved a letter outlining where we go from here. Next month, Joey will be visited at nursery to begin the support and start of assessment for autism. 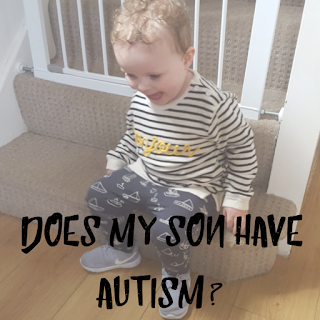 Joey hasn't had a speech therapy session since November and has been having issues at nursery with other kids so I'm happy that things are starting to come togetherto help him. Part of me feels relieved that we may have a reason for Joey being the way that he is. He isn't like a normal toddler and it's clear to see when we try and get out and amongst the public. Joey's endless tantrums stop us from doing normal family things and it's heartbreaking. Even though the assessment process has started, it's still going to be a very lengthy process. Aslong as we're given the right tools to support Joey that's all that matters.